Zhineng Qigong are simple and effective Chinese exercises which harnesses Qi energy and then directs it towards healing for to improve mental and physical health. Classes are held at the center by Barbara Pastorini. She has studied in China under the guidance of Master Tao Qingyu, a leading force in the Zhineng Qigong movement. “Zhi” means intelligence or the potential of the brain to understand and act with the outside world. Lift Chi Up, Pour Chi Down, are part of the teachings of Zhineng Qigong. Based on a holistic approach, Qigong helps by focusing the consciousness inwards, working with both mind and body movements. Daily practice increases vital energy and unblocks channels to improve health and conscious awareness together. QiGong Practices and free Qigong dance are offered in Amsterdam by Barbara Pastorini. The duration of the classes will be one hour and 15 minute. On donation base, (€5 recommended). For personal healing you can send me a email and we can meet one hour before the class. 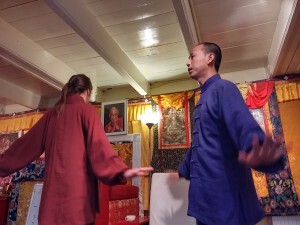 Participants can continue and practice the Zhineng Qigong method in the Netherlands or abroad through teachers trained and authorized by Chinese teachers. Participants can sign up as well in order to enjoy classes in China or make holidays together with the Masters. Healing, Qi Gong Travels are possible in China and Europe. Check the sections Events & Travel Pranic for the new upcoming travels. Contact bepranic@gmail.com for more info.